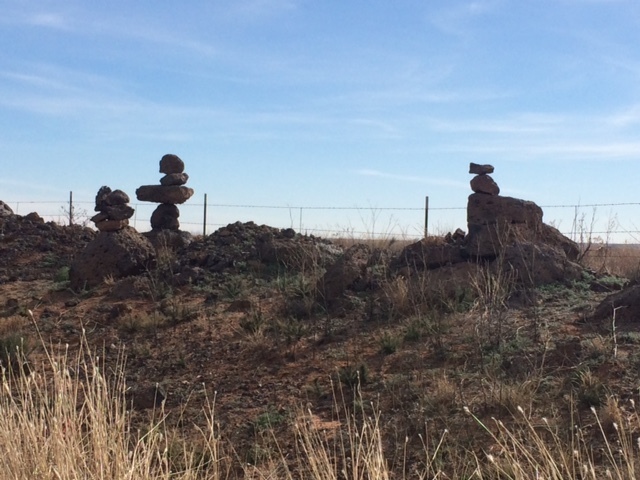 Trip Log – Day 209 – Columbus, NM to El Paso, TX | How Will We Live Tomorrow? Everything was easier today. The distance was shorter, the pavement smoother, the wind lighter, the grades shallower, the shoulder wider. I left early and logged forty-five miles before my noon lunch stop, sitting on the sand with my bike propped against a mile marker. I met two approaching cyclists: one traveling from Austin to Phoenix with a 150 pounds of stuff in a trailer, the other an El Paso local on a weekend joy ride. Everyone pedals his own ride. Beyond that, I saw no one. There are no towns or services, or even houses for over fifty miles. Yet, several people told me the Border Road is a great road to cycle because most of the scant traffic is Border Patrol officers, who are helpful with breakdowns. 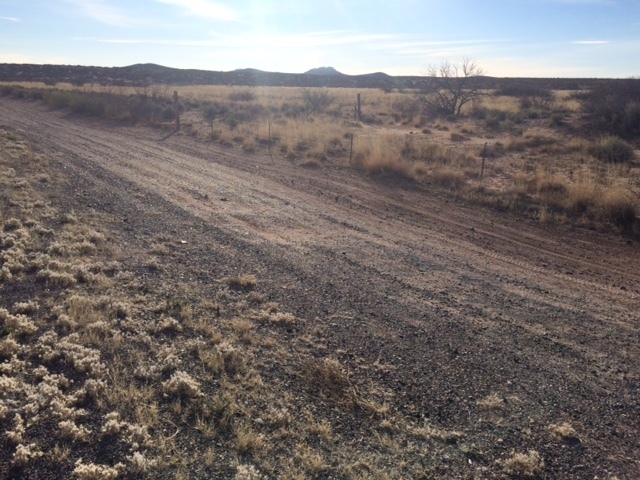 New Mexico Route 9 runs parallel to the border. A dirt road that runs parallel to Route 9. Beyond, a continuous barbed wire fence runs about fifty feet from the pavement. I wondered why the dirt road existed. Yesterday, I saw a Border Patrol truck driving very slow along the road, pulling two gigantic tires on their sides. The tires smoothed the surface. This morning I witnessed several other Border Patrol vehicles, driving off to the side and just as slow, scanning for footprints. Our pursuit of illegals is a complex, time-consuming and expensive operation. Along the road there are many cairns. I wonder what they signify? 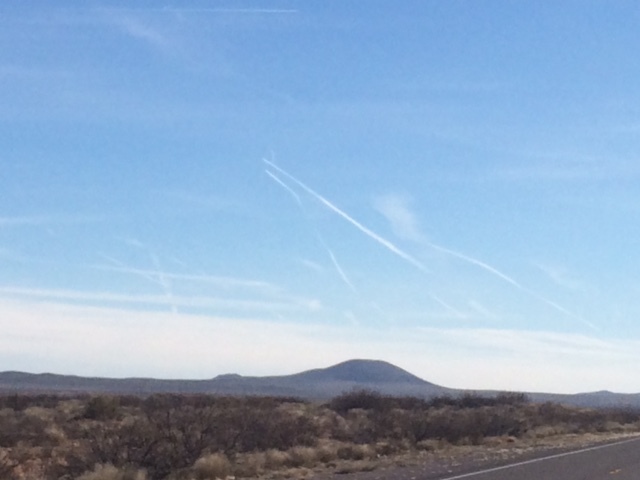 The first sign of El Paso was sixty miles out, the streams of jets doing maneuvers in the sky over Fort Bliss. I could smell El Paso and Juarez before I saw them. The air, which has been so sweet for the last few days, turned stale. Twenty miles away, the sky over the valley was brown. Somehow, our clean air laws haven’t taught the pollution to stay south of the border. 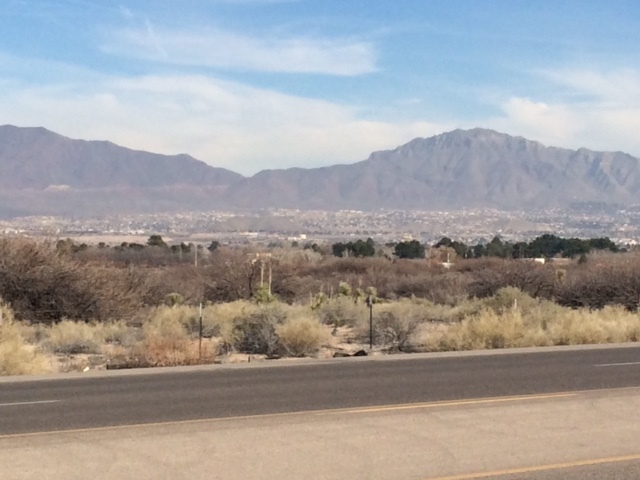 Pale flecks on the distant mountains, which indicated sand in the Chihuahuan Desert earlier in the day, were now buildings climbing the west side of El Paso’s mountains. I pedaled over the bone dry Rio Grande and under I-10. The transition from wilderness to the Mesa Road commercial strip was abrupt. It took only a few moments to realize that El Paso is not Tucson or Seattle. Bicyclists beware. Trucks cut me off, cars pulled out of driveways ahead of me. I took my time to arrive at my host’s safely. This entry was posted in Bicycle Trip Log and tagged Border Patrol, cairns, Columbus NM, El Paso TX, Fort Bliss. Bookmark the permalink. Darn if I knew you were goingto be in El Paso I would have conected you with my uncle (not). He’s a 78 year old ex military republican (living in Texas) – the futire of the Republican party as I like to say. Gotta keep up with me! Remember, I am happy to vary my route for interesting people – maybe even especially Republicans. I am heading east and saying south, but beyond that, anything and anyone is game.